Strongrrl: Life, with muscle: Say cheese! I've been wanting to try making my own mozzarella for a while now, and this week's pizza night seemed the perfect opportunity to dive in. This is actually a fairly simple process, made even more so by my discovery of Ricki's Cheesemaking Kit, which I picked up at our local cheese shop (Foster and Dobb's for the locals). The kit contains everything you need except the milk and a pair of rubber gloves. The rennet provided is vegetarian, which I appreciated. The next step was finding good milk — the fresher the milk, the better the cheese. As I posted last week, I found some great, local milk at the farmer's market. It's important that the milk not be ultra-pasteurized, a process that a lot of big-agro is using now because it extends the shelf life of the milk (handy if your trucking it far and wide). 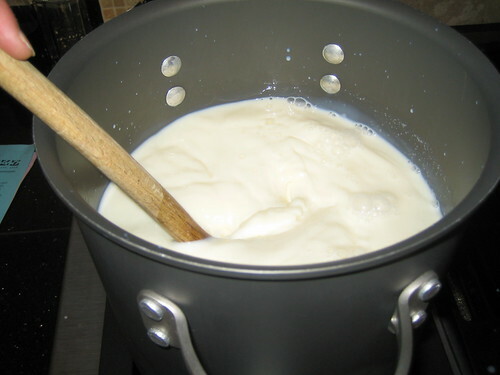 The ultra-pasturization does something to the milk, though, which prevents it from turning into cheese. 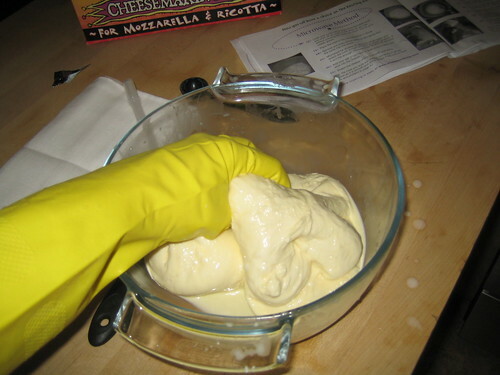 The kit contains a simple step-by-step guide on how to create mozzarella or ricotta cheese. Several, more experienced, cheesemakers told me not to expect success the first time, but everything worked perfectly. 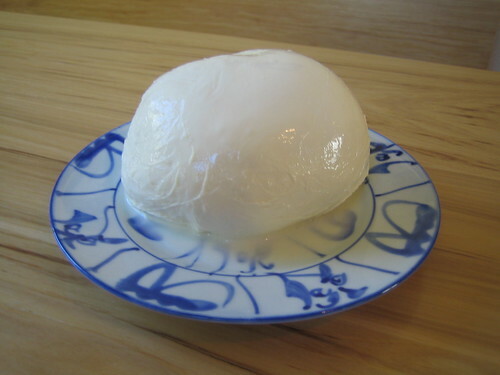 It really was very easy to make and, honestly, it's hands-down the best mozzarella I've ever had. The taste is richer and more flavorful, and it melts beautifully. 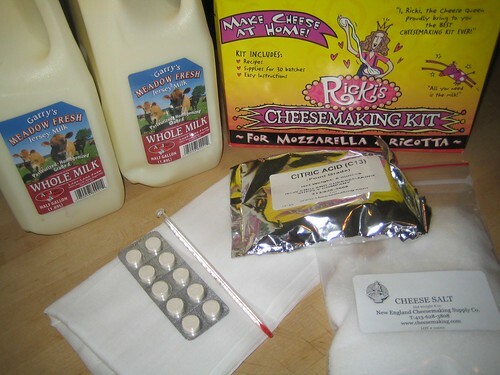 The kit, plus milk and gloves (not pictured), are all you need to make mozzarella or ricotta. Heating the milk, plus rennet and citric acid. Once it gets to the right temperature, you let it rest for 5 minutes until it becomes custard-like. 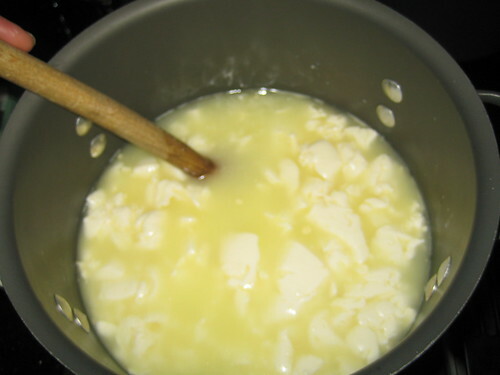 You then take a large knife and cut through the custard, separating the curds (cheese) from the whey (liquid). 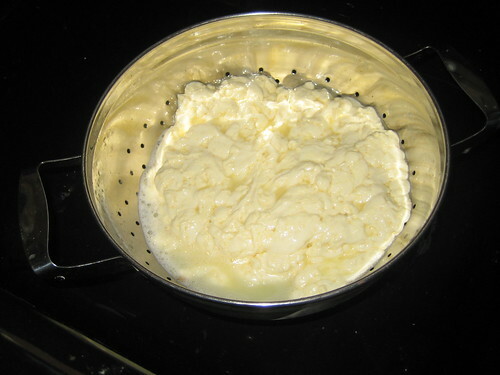 The curds with the whey strained off. A few minutes of kneading and stretching, followed by shaping into a ball and submersion into cold water. This is SO cool! We make so much pizza, we are building a wood fired pizza oven in the back yard. I am going to have to try this. Thank you!